The award-winning independent film about the amazing swing and bebop trumpeter Clark Terry is showing at The Ritz at the Bourse starting on November 21, 2014 for a short run. Was it fate or a divine hand that brought together a young drummer from Australia, an even younger visually impaired pianist, and a legendary jazz artist? Whatever force responsible for this triumphant triumvirate culminated in a grand and glorious documentary film, Keep On, Keepin' On - at the Ritz at the Bourse beginning on November 21st, which depicts the life and times of the celebrated trumpet and flugelhornist Clark Terry and his heartwarming relationship with 13-year-old blind pianist, Justin Kauflin. The third member of this fortuitous trio, a drummer from Australia named Alan Hicks, became a student of Terry’s, and was also as member of Terry’s band. It was there that he met young Kauflin, also a student of Terry’s. Hicks and Terry became close, and he was urged by Ad Hart, a cinematographer friend, to film a documentary about his friendship with Terry. Hart said he’d do the film work, if Hicks did the writing. Hicks decided to surrender his drumsticks and became a writer. He and Hart began to study how to put together a documentary. After filming, Terry and some of those he came into contact with for about a year, they asked Justin if they could include him in the filming, and he consented. Even though a year’s filming had produced some great scenes with Terry, and the inclusion of a number of jazz giants, the addition of Justin and the blossoming relationship between the youngster and his senior-mentor, made the film. Yes, the story began about a great musician’s life, but the natural human-interest elements of the film are poignant and heart-tugging, and they take precedence: Here is Clark Terry, suffering the effects of old age and diabetes - sometimes in bed at his home, or in bed at a hospital - being visited by his blind protégé. But despite their respective afflictions, teacher and student communicate personally and musically: the teacher instructing, and the student absorbing. The communication is a joy to behold. The same magic occurs when Terry is fit enough to play the horn, and the protégé is at the piano. Hicks and Hart pour money derived from their respective jobs, into the project. They also raise funds through Kickstarter campaigns. Along the way, Quincy Jones was called in as producer. Clark Terry was Jones’ first teacher, when Jones was about 13, and Jones still reveres him. So it wasn’t too difficult to recruit him. Watch this video and you'll have to see the film! Over his long and illustrious career, Terry has been a mentor to many, and a helpmate to countless others seeking his musical counsel. The film, Keep On Keepin' On, brings many he has coached, forward, with words of praise for him, and appreciative bows for his tutoring. Jazz figures the caliber of Herbie Hancock, Mulgrew Miller, Miles Davis, Diane Reeves, Oscar Peterson, Dizzy Gillespie and a host of others appear in the film, and offer testimony. I first met Terry about 30 years ago, when I was emcee at a now-defunct Philly nightclub called the 38th Street Café. Bandleader Joe Sudler brought Terry in as a guest to perform with the band. I had a chance to sit with terry in the club’s Green Room before the show and chat a bit. He was delightful, and had stories galore. 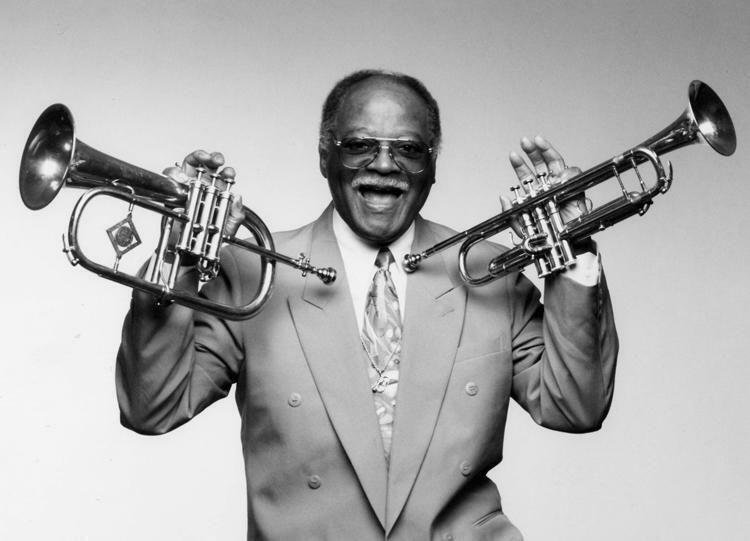 If anyone deserves a film in his honor, it is Clark Terry. He is one of the last of an almost bygone breed of entertainers. He is 93; many of his contemporaries are gone, and the few greats that remain would have a more than a difficult time matching his bio. Terry was the first African-American to hold a chair in the band on NBC’s Tonight Show, when Johnny Carson was host. Over the years, he’s received all manner of certificates, plaques, medals and other hardware in recognition of his musical abilities—and rightly so, because no one plays the trumpet or flugelhorn any better. He has always been a staunch advocate in support of jazz music, and jazz education, and has seldom, if ever, failed to extended a helping hand to those wanting to improve their musicianship. Terry has also been a member of the bands of both the Duke and the Count. But then, he, too, is jazz royalty! To jazz, he is at once a tenured tiger and a proud lion…even though he is now in the late-winter of his time. But, he has been, and remains…a bad cat! 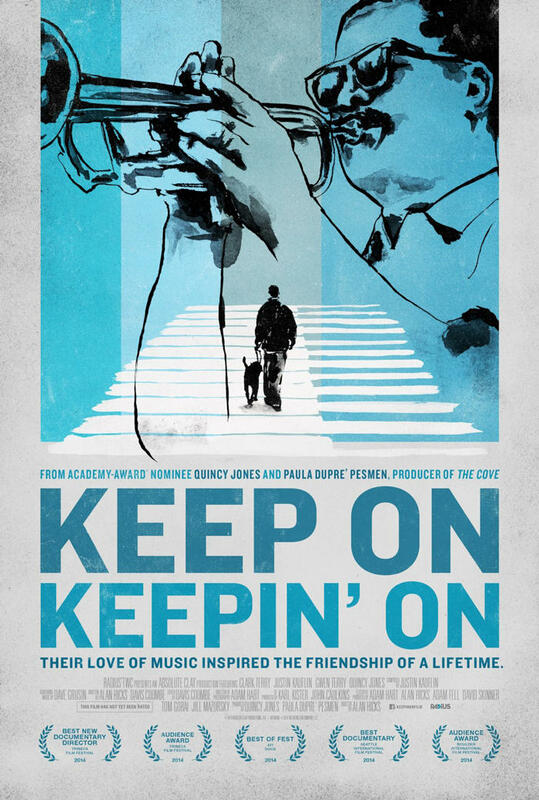 All of the aforementioned are reasons to make a date to see the film Keep On Keepin' On, which is on the big screen at The Ritz at the Bourse starting on November 21st. The film opened in several cities last month. And for those not familiar with Clark Terry, I’d like to suggest a multiple introduction, by way of the CD: Clark Terry and the Metropole Orchestra; and a book, titled: The Autobiography of Clark Terry.